Our website is currently having some tweaks made, we apologise for any inconvenience caused by some links which may not work. If you have any questions please do not hesitate to call us on 0121 433 4881. Your local expert photography shop and studio. 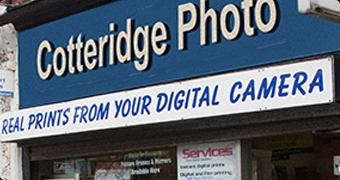 Cotteridge Photo Company is a photography shop and studio with a long trading history in Cotteridge, just outside of Birmingham city centre. We use our studio and retail premises to provide a comprehensive range of services, from commercial, portrait, wedding photography and also general developing and printing. We deliver a full range of services to our customers from traditional film to digital processing, enlargements, posters, framing, including made to measure, colour and black and white photocopying also a select range of digital cameras, and photo gifts instore as well as on our website. You can purchase our products online or visit our shop for a personalised service and full product ranges. Order online for fast delivery, or visit our store in Cotteridge South Birmingham. For all service and product enquiries please call 0121 433 4881. See our Contact Us page for more contact options.